Atlantic coast from Spain to SW British Isles. 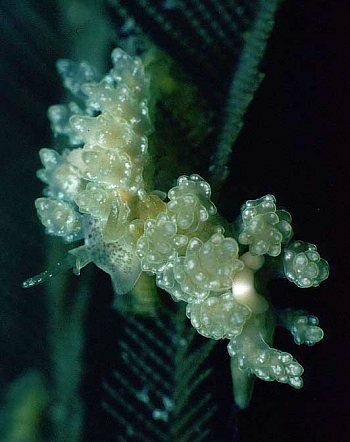 Translucent clear with some brown mottling on dorsal surface of body and white granules within the tubercles of the cerata. Grows to approx 10mm long, and has 4-6 pairs of cerata. Is found only on Aglaophenia tubulifera. • Thompson, T.E. & Brown, G.H. (1984) Biology of Opisthobranch Molluscs, Vol 2. 1-229 Ray Society: London. 156.